Tallahassee’s only ACA-accredited summer day camp, Camp Flastacowo is located at the FSU Reservation. The camp is open to boys and girls ages 8-13. Our camp counselors engage campers in a wide variety of activities including water safety, sailing, canoeing, kayaking, arts and crafts, swimming, challenge courses, team building, climbing wall and outdoor education. This job application is to be submitted by individuals who want to be considered for any of the available positions at Camp Flastacowo. Expectations of an applicant include the desire to learn more about facilitation and skills, as well as a personal investment in continuing a tradition of excellence both as an ACA accredited summer camp and as representatives of the Florida State University. Progression to the desired position will vary depending on experience, submission of application, interview process, completion of a background check and individual interest taken in the program. CPR and First Aid certification is required for all Campus Recreation employees. Required Training: May 28-31, 8:00 am until 5:00 pm daily. Required Availability: Weekdays – June 3rd through August 9th. Assist with planning and operation of Outdoor Educational Programs for boys and girls ages 8- 13. Focus on programs directed towards outdoor education sailing, canoeing, kayaking, arts and crafts, games and challenge course activities. Direct responsibility for age groups assigned during operation hours. Assist with implementation of daily schedules, games, and discipline. Promote leadership and display role model characteristics for youth. Provide consistent rule enforcement for the safety of all participants. Other responsibilities as assigned. Certification in or willing to obtain community first aid and CPR for the professional rescuer acquired prior to employment. Preference will be given to FSU students. Leisure Education, Physical Education, Teacher Education or Childhood Education major or professional experience preferred. Experience working with youth (ages 8-13) preferably in a summer camp environment. Need to provide information for background check as mandated by American Camp Association Accreditation standards. Supervise small groups from drop off to pick up. Supervise specific age groups throughout operational hours. Assist specialty instructors with all instructional programs. Provide high level of supervision in an open waterfront area at all times. Demonstrate exemplary customer service skills and promote facility, programs, and colleagues in a positive manner at all times. Assist with facility clean up during programs and at the conclusion of the day. Provide direct supervision of all group members during all activities. Directly reports to the Camp Administration. Provide leadership activities, games, and structured activities throughout the day. Assist the Director with drop-off and pick-up hours as needed. Other duties assigned. Provide a program that provides both outdoor adventure trips and comprehensive leadership instructions for boys and girls ages 14-16. The Explorer Camp Counselor will provide outdoor education and adventure trips with focus on programs directed toward hiking, canoeing, kayaking, swimming, and games. As well, create and teach a leadership curriculum. Direct responsibilities for age groups assigned during operating hours. Assist with implementation of daily schedules, games, and discipline. Promote leadership and display role model characteristics for the youth. Provide consistent rule enforcement for the safety of all participants. Responsible for the regular upkeep and safe operation of the Explorer Camp vehicle. Other responsibilities as assigned. Certification in or willing to obtain community first aid and CPR for the professional rescuer required prior to employment. Preferred certifications in Wilderness First Aid (WFA) or Responder (WFR) and lifeguard. Must have previous experience with outdoor recreation activities (hiking, canoeing, kayaking, swimming). Preference will be given to FSU students. Leisure Education, Physical Education, Teacher Education or Childhood Education major or professional experience preferred. Experience working with youth (ages 14-16) preferably in a summer camp environment. Possess working knowledge of leadership theory and student development. Need to provide information for background checks as mandated by the American Camp Association Accreditation standards. Report directly to Camp Administration. Supervise small groups from drop off to pick up at the Camp facility and out on excursions. Assist with facility clean up during programs and at the conclusion of the day. Demonstrate exemplary customer service skills and promote facility, programs, and colleagues in a positive manner at all times. Responsible for regular upkeep and safe operation of Explorer Camp vehicle. Provide structured activities throughout the day. During leadership activities Communicate class objectives, safety standards, and curriculum adequately to all participants. Customize course materials to the needs of the participants. Create non-threatening environment that is conducive to participant achievement. Adapt teaching methodology and approaches to the experiences and ability level of participants. Provide constructive, positive feedback. Provide comprehensive challenge programming for the participants of Camp Flastacowo. Responsible for safety, instruction, supervision during program times, and maintenance of the challenge course. Preference will be given to FSU students. Recreation, Leisure Services, Education, Physical Education, or Child Development major or professional experience highly preferred. Must have previous experience with a challenge courses and have completed the FSU Facilitator Training. Must complete background check as required by HRS. Report directly to the Camp Management. 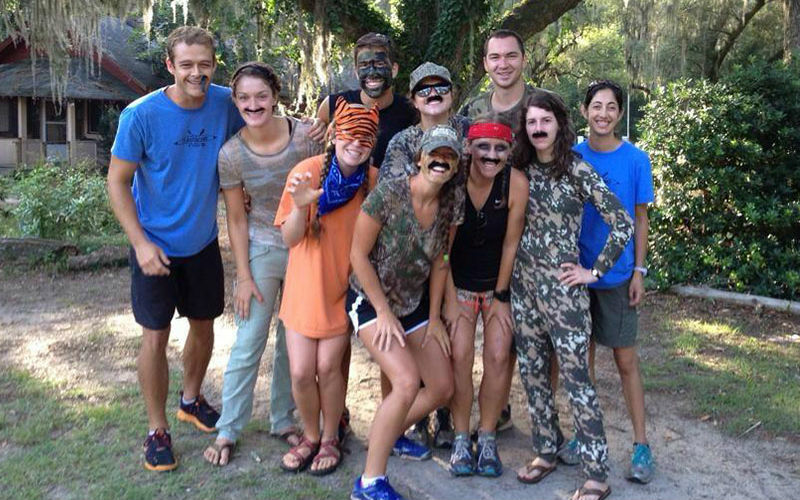 Intimate knowledge of low ropes course events, field games, and team-building activities. Familiarity with the philosophy of experiential education. Customize course materials to the needs of the participants. Create non-threatening environment that is conducive to participant achievement. Provide constructive, positive feedback. Provide special event activities based on skills. Assist in set-up and clean up of all equipment and supplies related to the program. Notify Camp Management of all repairs and safety issues in timely fashion and in writing. Assist the Director with drop-off and pick-up hours as needed. Other duties as assigned. Provide comprehensive learn-to-sail program for beginners. Responsible for set up and clean up of instructional area. Provide rainy day programs as needed. Provide safety and supervision during program times. Other duties as assigned. Preference will be given to FSU students. Recreation, Leisure Services Education, Physical Education or Child Development major or professional highly preferred. Previous experience as sailing or windsurfing beginner instructor in program for youth ages 8-14 as approved by U.S. Sailing Association or other nationally recognized introductory sailing program. Demonstrate proficiency in the skills and fitness level required for a comprehensive introductory sailing program for youth. Must complete background check as required by HRS. Report directly to the Camp Management. Possess working knowledge of lateen rig hull. Demonstrate knowledge of reasonable care and maintenance of instructional sailing fleet. Demonstrate knowledge of basic sailing principles including: boat and sail parts, true and apparent wind, rigging, tacking, jibing and knots and lines. Demonstrate thorough knowledge of basic safety principles such as minimum standards for water skills, capsizing, man-overboard recovery, rights of way, weather and currents. Must possess thorough knowledge of facility emergency action plans. Must be familiar with standardized learn-to-sail programs as endorsed by nationally recognized associations. Provide for health and safety of all participants at all times. Ability to teach beginner level sailing for ages 8-14. Communicate class objectives, safety standards and curriculum adequately to all participants. Customize course materials to the needs of the participants. Create non-threatening environment that is conducive to participant achievement. Adapt teaching methodology and approaches to the experiences and ability level of participants. Provide constructive, positive feedback. Provide special event activities based on skills mastered during the program. Assist in set-up and clean up of all equipment and supplies related to program. Notify Camp Management of all repairs and safety issues in timely fashion and in writing. Provide evaluations to parents as requested. Assist the Director with drop-off and pick-up hours as needed. Other duties as assigned. Provide comprehensive arts and crafts program for beginners. Responsible for set up and clean up of instructional area. Provide Camp Management with supply requests. Provide safety and supervision during program times. Other duties as assigned. Preference will be given to FSU students. Art, Recreation, Leisure Services Education, Physical Education or Child Development major or professional experience highly preferred. Previous experience as art instructor in program for youth ages 8-13 is preferred. Demonstrate proficiency in the skills required for a comprehensive arts and crafts program for youth. Must complete background check as required by HRS. Report directly to the Camp Management. Possess working knowledge of camp arts and crafts activities that may include: basketry, beadwork, candle making, paper mache, ceramics, drawing, handicrafts, jewelry, painting, etc. Demonstrate knowledge of reasonable care and maintenance of instructional supplies. Provide for health and safety of all participants at all times. Ability to teach beginner arts and crafts skills for ages 8-13. Communicate class objectives, safety standards and curriculum adequately to all participants. Customize course materials to the needs of the participants. Create non-threatening environment that is conducive to participant achievement. Adapt teaching methodology and approaches to the experiences and ability level of participants. Provide constructive, positive feedback. Provide special event activities based on skills mastered during the program. Assist in set-up and clean up of all equipment and supplies related to program. Notify Camp Management of all repairs and safety issues in timely fashion and in writing. Provide evaluations to parents as requested. Assist the Director with drop-off and pick-up hours as needed. Other duties as assigned. Provide comprehensive outdoor education program for beginners. Responsible for set up and clean up of instructional area. Provide Camp Management with supply requests. Provide safety and supervision during program times. Other duties as assigned. Preference will be given to FSU students. Environmental Science, Recreation, Leisure Services Education, Physical Education or Child Development major or professional highly preferred. Previous experience as an outdoor educator in program for youth ages 8-13 is preferred. Demonstrate proficiency in the skills required for a comprehensive outdoor education program for youth. Must complete background check as required by HRS. Report directly to the Camp Management. Possess working knowledge of outdoor education activities that may include: hiking, campfire safety, wildlife identification, map reading, outdoor cooking, trip planning, knot tying, Leave No Trace (LNT) principles, etc. Demonstrate knowledge of reasonable care and maintenance of instructional supplies. Provide for health and safety of all participants at all times. Ability to teach outdoor education skills to ages 8-13. Communicate class objectives, safety standards and curriculum adequately to all participants. Customize course materials to the needs of the participants. Create non-threatening environment that is conducive to participant achievement. Adapt teaching methodology and approaches to the experiences and ability level of participants. Provide constructive, positive feedback. Provide special event activities based on skills mastered during the program. Assist in set-up and clean up of all equipment and supplies related to program. Notify Camp Management of all repairs and safety issues in timely fashion and in writing. Provide evaluations to parents as requested. Assist the Director with drop-off and pick-up hours as needed. Other duties as assigned. Provide comprehensive archery programming for beginners. Responsible for set up and clean up of instructional area. Provide rainy day programs as needed. Provide safety and supervision during program times. Other duties as assigned. Preference will be given to FSU students. Recreation, Leisure Services Education, Physical Education or Child Development major or professional highly preferred. Previous experience as Archery instructor in program for youth ages 8-14 as approved by USA Archery or other nationally recognized introductory Archery program. Demonstrate proficiency in the skills and fitness level required for a comprehensive introductory archery program for youth. Must complete background check as required by HRS. Report directly to the Camp administration.Responsible for safe and effective operation of the Archery Program, and it’s coordination into the entire camp program. Set up and maintain safe and adequate field archery courses. Must possess thorough knowledge of facility emergency action plans. Must be familiar with standardized learn-to-sail programs as endorsed by nationally recognized associations. Provide for health and safety of all participants at all times. Ability to teach beginner level archery for ages 8-14. Communicate class objectives, safety standards and curriculum adequately to all participants as set forth by the ACA and Camp administration. Customize course materials to the needs of the participants. Create non-threatening environment that is conducive to participant achievement. Adapt teaching methodology and approaches to the experiences and ability level of participants. Provide constructive, positive feedback. Provide special event activities based on skills mastered during the program. Assist in set-up and clean up of all equipment and supplies related to program. Notify Camp Management of all repairs and safety issues in timely fashion and in writing. Provide evaluations to parents as requested. Assist the Director with drop-off and pick-up hours as needed. Other duties as assigned. Conduct administrative duties as assigned, to include handling money, receipting, maintaining accurate financial records, scheduling, programming, and assisting with data entry. Preference will be given to FSU students. Must be PC literate, including knowledge of MS Word and Excel software programs. Must be able to operate cash register. Ability to work cooperatively with parents, children, and staff. Maintain high standards of professionalism. Excellent organizational skills a must. Previous administrative experience preferred. Must complete background check as required by HRS. Assist Camp Management with camper check-in and drop-off. Interact with parents and represent FSU Reservation positively. Receive payments and registrations from parents and provide receipts for payments. Maintain accurate records of payments and camper attendance. Assist with maintaining staff time sheets and payroll. Assist in creating a non-threatening environment that is conducive to learning and participant achievement. Other duties as assigned. If you have any questions, please contact us at 850-644-2266 or via email at jmerrick@fsu.edu. Thank you for your interest joining the Camp Flastacowo team!